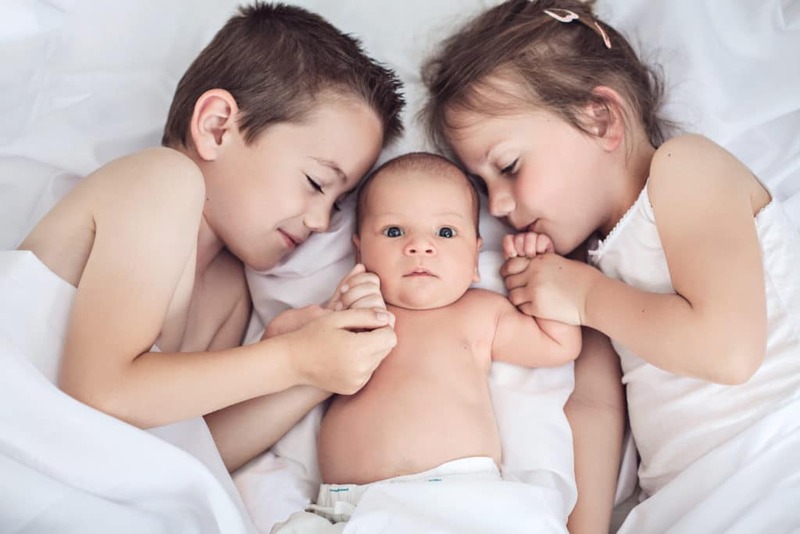 A new baby is a huge change for big siblings. Here’s how you can use your doula training to help older children when they welcome a new brother or sister. A recent article from the BBC posed the question: would you let your children watch you give birth? Well-known TV chef Jamie Oliver, and his wife, Jools, made headlines after their fifth child was born. In the birth announcement introducing their son, Oliver mentioned their two eldest daughters had been present for the birth. Poppy Honey (14) and Daisy Boo (12) even had the honor of cutting the cord. Of course, like so many things about giving birth, this is a personal decision that may not be right for everyone. After completing your doula training, you can help your clients explore the pros and cons of having older children at the birth. The mom has to feel comfortable with her children being present at the birth. There needs to be another trusted adult present who can help care for the child, such as a sibling doula. The child needs to be prepared in advance for what will happen during labor and birth. Invite the child the prenatal appointments. This will give them an idea of what to expect when their mother is in labor. Knowing what’s coming will make the intense moments of labor less of shock. Check out YouTube videos showing what it’s like to have an older child involved in labor. Keep these links handy and suggest your clients watch them as well. As a birth doula, you are a trusted resource for the families you serve – always be prepared! Help the family come up with creative ways to involve their child in the birth. Older children can assist with physical comfort measures. This is a great thing to show them during prenatal appointments. They can also take photos, or cut the cord. Younger children can be assigned simple tasks like bringing mom a glass of water, stroking her hair, or giving their new sibling a blanket or stuffed animal after the birth. After completing your doula training, you can add Sibling Doula to your services. This is a service in which the doula takes over the primary care of the siblings during the birth. The sibling doula provides emotional support and expert guidance to the children while mom gives birth. As a result, the mom-to-be is able to include her children, while fully focusing on the important task in front of her: birthing her new baby. Welcoming a new baby transforms everyone involved. Once you go through doula training and start attending births, you will see for yourself how incredible it is. You will be there not only for the birth not only of a new baby, but for the birth of a new family.